The early morning roll-call hasn’t changed, we were up for breakfast at 4am, on the line by five-thirty for a six am start. But as I look around I’m fully aware that everything else has changed somewhat. Standing around me, in this town, at this unholy hour, 11,000 riders have gathered to ride the event. Today, normal life has stopped and the cycle industry has taken over – the whole town rolls over belly-up and accepts the inevitable. Once a year this land belongs to the riders. Locals embrace us in the streets, they honour us in the cafes and restaurants and later on in the day they will shout themselves hoarse for us as we grind our way up arduous mountains in near 40°C heat. They even close all the roads for 205 baking hot kilometres. Nove Colli translates as ‘nine hills’. Italy’s favourite mountain climbing cocaine addict, Marco Pantani, used to live and ride here (there’s a statue of him in the town square), so there are no surprises as to what’s coming. After 25 kilometres of high-speed, flat, closed roads we meet the first of nine punishing hills. We’re going up them all, for a total of almost 4,000m of climbing. Despite the early start, the whole town is out in support; helicopters strafe the sky, the noise is as stifling as is the heat. When the gun goes off, within 30 seconds of clipping into my cleats I find myself doing 30mph in the middle of the biggest road race you’ve ever seen in your life. 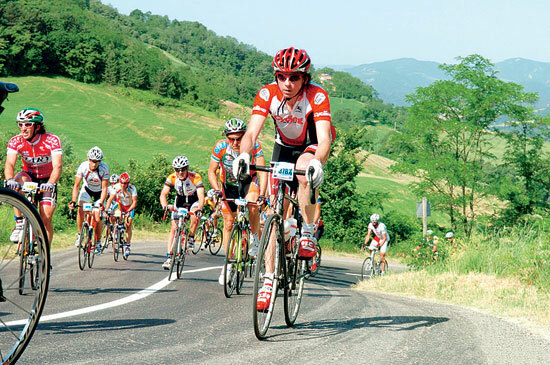 This is classic form for an Italian gran fondo, where the event is more akin to a mass-start road race than a relaxed UK sportive. There are pro teams here going all out to win for the lucrative prize money and sponsorship deals on offer. It is, shall we say, a little competitive. Despite a few nasty looking crashes in these early kilometres I arrive at the climbs relatively unscathed and settle into the main business of the day – riding uphill. Energy conservation, eating and drinking properly are the keys to finishing this. As the sun gets higher, the temperatures soar and the locals bring the noise. Each hilltop has a town square trying to outdo the previous one with the size of its street party. You can hear the frantic MCs and pounding dance beats from miles down the hill. And there are hundreds upon hundreds of spectators shouting at you long before you reach the outskirts of the towns. Feed stations are plentiful, though I suspect you could knock on any door and get invited in for pasta and wine, such is the reverence on display for the competitors. One by one the mountains fall as I click them off my mental map of climbing torture. Polenta, Pieve di Rivoshio and Ciola all take upwards of 30 minutes to scale. 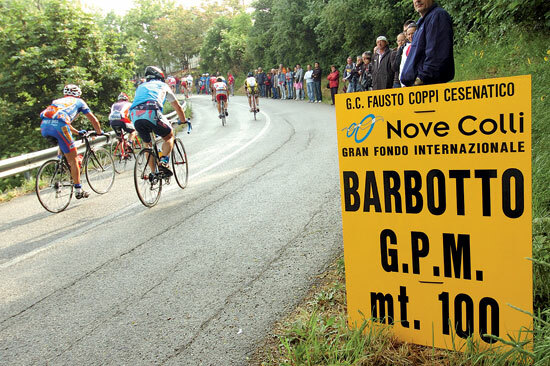 Then I’m on the fearsome Barbotto, which though short at five-and-a-half kilometres is close to 18 percent for far too much of its length for my money. The temperature on my computer topped out at 39°C but I was rewarded with a near-50mph flying descent, just about enough to cool me down. There is a big test at around 90 kilometres when riders are given the choice of returning directly back on the shorter 130-kilometre route. In the heat, many thousands did and the effect was psychologically draining. 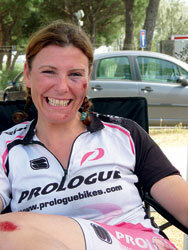 I chose to continue onto the fearsome long drags of the Perticara and Monte Pugliano. 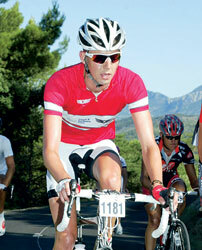 The final two climbs were shorter and the realisation that I had the big ones behind me spurred me on. The final climb of only 349 metres – Gorolo – was a ladder of steep hairpins towards the top and was tortuous. Sure enough, large pelotons were forming and fragmenting at ridiculously high tempos given what had gone on before, the action heightened to fever- pitch by the blaring of traffic horns as motorists encouraged us to the line. The excitement of the final kilometres will stay with me for life. The support from the crowds and the camaraderie of the riders were sky-high. It’s not the longest or hardest sportive I’ve done but under these conditions it was the toughest. And it was consummately the best.